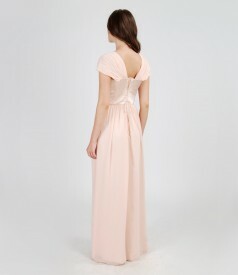 Elegant veil dress with ruffled wing type sleeves, doubled with matching elastic satin. Front waist and neckline outlined with crystals trim. The corset tightens in a bow on middle back. Left-side concealed zip fastening.